I have no idea what the tiny attacking army is thinking, but apparently they are trying to besiege this cute, impenetrable fortress. The scene, built by Timothy Shortell, is as complete as they get. 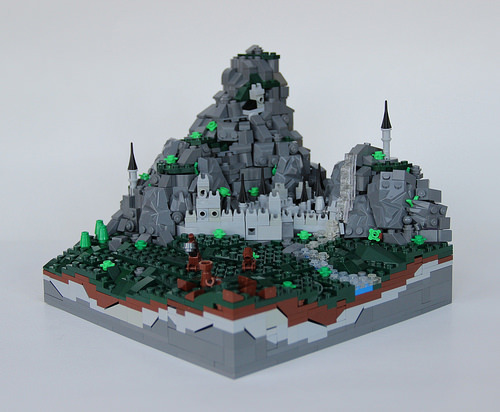 There’s ingenious use of parts in the siege equipment, the dark green plains are dynamic, the castle is highly detailed and, most of all, the intense cliffs at the back are amazing. I have never believed them to be useful in a serious creation, but at this scale and level of texture, the rocky wedges (part 64867) at the left and right ends of the cliffs actually look perfect. What a fantastic mini-scene! Superb detail, especially for such a small scale.